Best Gun Safes Reviews If you own any kind of firearms or gun, then this article is exactly for you! Buy the best gun safe to keep your collection of firearms protected from the outside reach of children and others. Weapons must be in gun safes for the good of all! Sticking immediately to the subject, let’s first define and talk about the different gun safes. 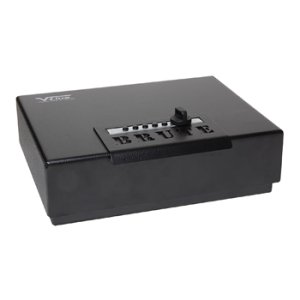 A gun safe is a specially designed container where guns and the ammunition for these guns, are to be secured. One thing to remember, is that gun safes are not the same as the usual home safes, where you keep documents or money. Gun safes possess certain features which make them exceptionally secure, and offer protection from theft, damage, fire and more. Everyone who owns a gun or any kind of firearm, should get a gun safe, as it is the only way to prevent other people having access to them. This is of monumental importance, if you have children in the home. 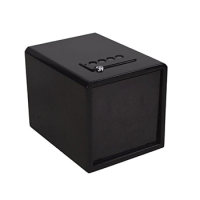 Gun safes come in various sizes, shapes and with an assortment of other features. To buy the best gun safe might be a complicated task, especially for those who are not aware how to differentiate between the models of high-quality safes, for their weapons. The table below will acquaint you with the most important features that any quality gun safe, with a high level of protection, should possess. There are additional options for even the highest security of your weapons. The amount of storage space your gun safe will provide, is of crucial importance. In any case, experience has long proved that the bigger your gun safe, the better. Sometimes, the capacity of the gun safe that is guaranteed by the manufacturer might not correspond to the reality of it, and hoping to have a lot of guns in your new gun safe, you might find out that not all your guns fit into it. This is why, when choosing a gun safe, consider the exact amount of your gun storage needs, and realize it is only half of what you may expect. There is more to it: you need to consider the possibility of acquiring more rifles in the future, as well as other gun related items, such as ammunition and more. You may even keep other precious possessions in with your guns, to secure them as well. 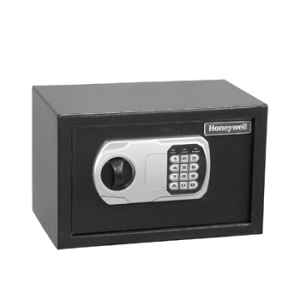 Thus, it is better to choose a safe that will be at least twice as big, compared with the exact size you would need. Of course, gun safes are not cheap, but if you own a rifle, you are expected to also be able to afford a safe, where you can secure it. The larger the gun safe, the more expensive it will be. However, it is better to pay once for a gun safe that will surely have enough capacity for all of your guns, than to install a gun safe that will eventually end up being inadequate. The recommended storage space for the best gun safe, would be that it has the ability to provide space for a minimum of 18 guns. If you buy, say, a “24-gun safe” which means you might be able to fit in it exactly 24 guns, of a thin or small size. However, it will look “overstuffed”, and you might not even be able to get to the guns inside, if they are in the back, without having to remove the other guns. So, the theory of buying a safe that is twice the size needed, remains the same. Another good way of storing more guns in a gun safe, is to get a rotary rack. Due to its flexible design, the latter will enable you to access any gun you want quite easily. Despite the fact that the rotary rack might occupy a little space, it will still have more space saving storage, because if you are buying a 22-rifle safe, you’ll be able to comfortably store about16 rifles in it. 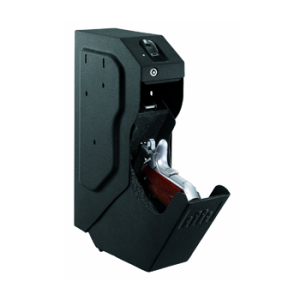 Safes that come with the availability of a gun rack on their doors, save a lot of space. There should also be space for other stuff, such as the ammunition, safety equipment, or maybe things like documents, money, etc., It often happens that family members want to keep their “treasures” safe with your rifles, too. If your gun safe does not provide sliding drawers, or small shelves, then you can easily install some on your own. You can also secure small weapons such as pistols and revolvers, etc., in these. The weight of gun safes, may vary from hundreds, to thousands of pounds. The minimum weight recommended for a gun safe is about 750 pounds (340kg). The advantage of a heavy gun safe is that they offer more protection against theft. It should also be mentioned here, that gun safes are to be bolted to the floor or wall. The main materials from which your gun safe is made of, like the steel and the concrete, contribute to the safe’s heavy weight, as well as, other factors, such as the size, the storage space or capacity, etc. Obviously, the heavier the gun safe, the more secure it will be. However, heavy gun safes, such as models that weigh 2,000 pounds, (about 900 kg), can be quite expensive. If you can afford to employ professionals, to install it in your house for you, it might turn out to be a worthwhile investment. 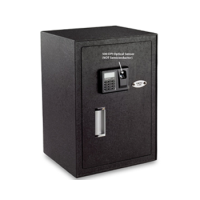 But, if you don’t money in the budget for a big gun safe, we recommend that an economical and safe option, would be a safe that weighs about 750-pounds. Surmising from the described features above, we conclude that when it comes to bolts to secure the gun safe, we should use the following motto: “The more, the better”. It is believed that it’s best to use the same theory, when referring to the number of locking bolts, that a gun safe is expected to have. The minimum number of locking bolts on each of the four sides of your gun safe door, should be 2. The bolts need to be 1”, (3cm), or longer. However, what really matters about a gun safe when you are considering the locking bolts, is its design. This determines the durability of the bolt. The bolts that have the ability of extending far inside the door, will provide more security from thieves. The locking bolt material also matters a great deal. Make sure it is made from solid metals, such as steel. secure locking bolts, without the need for pins and clutches. Additionally, there is such a thing as “hinge side bolts”. The hinge sides should also have secure locking bolts. There are internal and external locking bolts. Depending on how much room you need or want to open the doors, should depend on the bolt type you choose. Combination or dial locks: These are quite durable and trouble-free. This type of lock mechanism will allow access, when the proper numbers are entered in the proper corresponding order. This is the most common lock mechanism and has no maintenance requirements. The only downside might be the that dial locks do not automatically lock when you close the safe door, and they also require more time to open the door when compared with the other type of lock mechanism. Note: Every time you close the door, remember to lock it. Electronic or digital locks: These types of locks, are not known for being very secure, in spite of the advantages of being able to open the door faster, and having it lock automatically after the door is closed. Also, these locks require regular battery changes. A digital lock comes with a keypad and fingerprint lock. They are mainly found on relatively inexpensive safes. 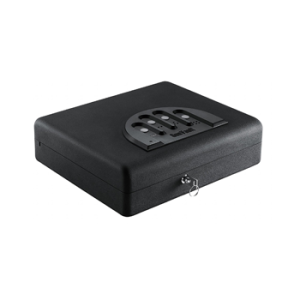 The keypads might fail easily, and whenever your digital lock breaks down, you need to be ready to pay a specialist for opening it. The construction of a gun safe should be solid and sturdy enough, to not only prevent thefts, but to be able to endure such disasters as fires or floods. A high-quality construction should imply that the safe is designed with continuous welds, which excludes stitch welding. Wall thickness is an important feature because it is also directly linked to a high level of security. Thicker walls will cost you more, but will pay you back by providing better security. The minimum recommended wall thickness is about 10 gauge. As to the door, it should be at least 1” thick or more. It is of paramount importance for a gun safe to be fireproof for the simple reason that guns tend to melt down very easily, say, in such temperatures as 800 F/425 C. Some high-standard fireproof gun safes are equipped with either a kind of sheetrock (gypsum board), or ceramic panels, that can protect the interior of your safe, up to temperatures as high as 350 F/175 C, from 15 minutes to 4 hours. protected your weapons during a fire. However, there are manufacturers who guarantee the sheetrock will remain within the walls, should such an event occur. 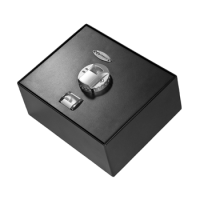 Generally, a quality, fireproof safe, comes with a continuous welded inner shell, that is meant for protecting the guns’ inner parts from fire. There is also a barrier aimed at preventing the interaction of the heat from the fire and the air inside the gun safe. It has even been estimated that fire is more dangerous to your rifles, than their theft. However, there is some controversy concerning the fireproof gun safes, as to how “realistic” they are, in actually providing enough fire protection. Most people look at the fire rating, which is unrealistic, because there is no gun safe these days that really possesses the required rating, which is UL 72 Class 350. Fire insulation, which implies the type, the thickness and the coverage of said fire insulation. The best material for fire insulation would be poured concrete amalgamate. Intumescent door seals, meaning the outer steel shell of the body, must be thick enough, to protect the safe from fire. Fire safe ratings vary from manufacturer to manufacturer, and when choosing a fireproof safe you should instead, pay attention to the details mentioned above. The waterproof feature of a gun safe means that your guns should remain dry, even if the safe is tossed in, or saturated by water. 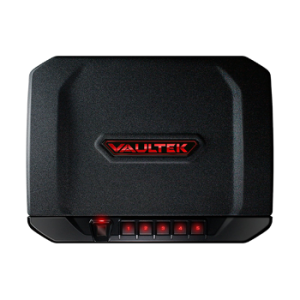 This feature will keep your firearms and other valuables safe and dry, in case of floods. The latter mostly happens, when individuals attempt to put out a fire, with a water-filled fire hose. Make sure your quality gun safe comes with all the necessary features mentioned above. Most warranties of gun safes are not considered to be customer friendly. Most manufacturers’ warranties won’t cover the expenses that result from natural disasters or burglary. The few that do have some type of coverage for these incidents, don’t offer much compensation. If your gun safe lock fails, then you are responsible for payment to a specialist to open it, though the warranty might get you a new lock. 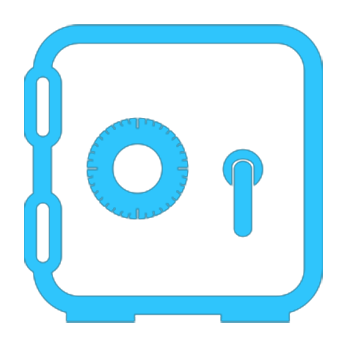 Remember to be careful when opening and closing your safe, because if you close it incorrectly or too forcefully, in most cases, the warranty will not cover the costs of the lock failure. Though the warranty is not the most important feature of your gun safe, you should at least have something to cover manufacturer’s defects or damage, to some extent. However, as a gun owner you must have homeowner’s insurance, which is a great asset, because it will cover a lot of the gun safe expenses, if necessary. There are many benefits of having a gun safe, and as an owner of any kind of firearm, it is highly recommended to purchase one as soon as possible. In fact, there is a kind of an obligation that safety is associated with gun ownership and should come out of your sense of responsibility. Safety – A gun safe provides you with two safety factors. The first one is the most important and it is for the safety of your family and any guests or visitors in your home. Maybe this is the reason you have purchased a gun for in the first place, for the sake of your family’s protection. However, perhaps not all of your family members know how to handle a gun safely, and things can get more dangerous with a gun in the house, if you have little children. This means that the possibility of an unintentional gun accident, is much higher, and might result in serious injury and or death. There is an estimated number of people that die every year, simply because they have not followed the safety rules or taught them to their families. There are many reports of accidents committed by children, after finding and playing with a gun in the home. When you consider the staggering statistics, keeping your guns safely locked away becomes a huge necessity. The second safety issue is the anti-theft factor. The possibility that a robber would be able to break into a quality gun safe, and obtain any firearms from it without a key or a combination, is extremely low. Gun safes usually have solid locks, the safest ones being the non-electronic options. 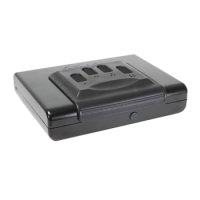 In addition to this, they are very heavy, and when attached to the floor or wall, it is practically impossible for a burglar to steal your safe by trying to lift it. The lock will be very difficult to break, if the mechanism is of high quality. Even if the lock could be broken, it is unlikely that the burglar could open the door to get what is inside of it. No one wants to lose their guns or have them stolen, especially considering how expensive they are to replace. So, keep your guns and your family safe, by installing a high-quality gun safe at your house. It is beneficial to have your guns be safe from fire or water issues. Some gun safes, as mentioned above, come with special features to make them fire and waterproof. Hence, in case of fire, you can be sure that a fireproof gun safe will protect your guns from melting or being damaged. This is the case with flooding disasters too, or other types of water accumulations, as a result of kitchen or bathroom appliance malfunctions, or broken pipes when you are not at home to save them. The threat the items in your gun safe will be harmed, is greatly reduced when you have the waterproof feature. Even your ammunition should be safe from getting wet and breaking down. Last, but not least, a gun safe is a good way of having your firearms neatly collected in one place. Not only does this provide fast and easy access to them, it can also keep them out of sight. Just keep in mind to buy a safe twice as large, as the amount of your guns, to ensure your whole collection will fit inside of it. Having discussed the main benefits of owning a gun safe let’s move on to present some additional, but not less important reasons, to completely convince you, as an owner of a firearm, in the necessity of purchasing a gun safe. A gun safe is a great way to show that you, the gun owner are a responsible citizen, and feel justified in owning a rifle, for instance, but showing that you will keep it secure in your home. It is also helps in showing your community, that all gun owners can, and should be held accountable for the proper, and safe storage of their firearms. Many people want to feel protected against crime and have been learned how to handle all aspects of a gun effectively, starting with a show of good faith, that you have purchased a dependable storage unit for it. Owning a highly secure gun safe for the storage of your firearms, proves that a conscientious and knowledgeable person, can indeed, own a gun for their own protection, while not violating others in any way. By owning a gun safe, you may get a discount on your home owner’s insurance with proof of said purchase and use. Be sure to check the availability of this and your specific insurance policy, before buying your safe, for this reason. You wish to keep your expensive gun collection under lock and key, so to speak, to protect them and others, from any accidents. Suppose your guns are stolen despite you owning a gun safe, you will still have benefits from the safe. Do you wondering how that could be? If you are burglarized and your guns are stolen, you can provide proof of being responsible, by owning a gun safe. Your stolen gun could even end up in the hands of an inexperienced person, or be used in a crime. Worse yet, if your personal firearm is used in a shooting and someone is injured or killed, the victim’s family may try to file a lawsuit against you. By owning the gun safe, you not only show your responsible conduct to lock your guns away, it also shows your good judgement to be prepared as best you can, against the theft of your guns. By following the proper procedures to secure your guns, your fault in the matter is diminished vs. someone storing their gun in a bedside table or under the bed, where it can fall prey to burglary or home accidents. Every gun is much safer stored inside a solid gun safe that is specially designed for this particular item. A gun safe is also a good place to store your important documents and valuables, for the same reasons as why it keeps your firearms safe. They are much bigger and heavier than a home safe, thus, a better location to store these other items as well. Thieves cannot lift, carry and take away the gun safe without much effort, or without being noticed by neighbors. Your guns and valuables will be protected from getting lost or stolen, whether you are in the home or not. Another reason we would like to mention for buying a gun safe, is the factor of aesthetics. Most gun safes now are not only a safe place for your firearms, but they are also beautifully designed, and will look nice in your house. Some are created to look like a regular cabinet, not giving any indication as to what is stored inside. Just be sure to place it in the best location, inside your home, so you can access it when needed, without having to move other furniture. It is obvious from all the benefits and reasons mentioned above, for buying a gun safe, it is a great asset to have one in your home, to house all your firearms. By now, you have probably formed an image in your mind as to what kind of safe you might need. If not, just remember to start with the idea of the number of guns you presently own, others you are thinking of purchasing, as well as other valuables, you might want to keep in them. All that is left to do, then, is to choose the one you like the most. It goes without saying that you will want to buy one from a reputable and reliable manufacturer. We know that you will feel better equipped to purchase the right gun safe for your home after reading our information from Reviews Bee. We are glad to be of help! The total Reviews Bee rating sums up the overall picture of every product. Reviews Bee works tirelessly to ensure that we are providing the best product recommendations to you and your family. 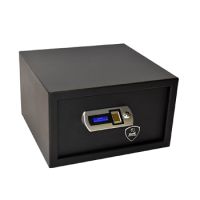 In rating the various gun safes available, we strive to give you the best information possible.Our algorithm includes information from both expert and consumer resources. There is no need to spend hours on researches, because Reviews Bee instantly gives all researches and analysis for you and creates a Top list to save your time and money. 2. We Analyze the Data Expert Popularity Score, Expert Ratings, Consumer Popularity Score, Consumer Ratings and Consumer Complaints are inserted into our algorithm in order to calculate our Reviews Bee Score. This score, in turn, is used to rank each gun safe in our Top 10 recommendation. The Reviews Bee score is a summary of each of the most important factors indicating the value of a gun safe. 3. We Deliver The Best Results By taking each of these essential factors into account, we are able to give each gun safe an overall Reviews Bee Score that ranks each product against the others in our Top 10 list. By using a vast array of expert and consumer ratings, reviews, and feedback, Reviews Bee provides you with the most comprehensive analysis of product information available to you. You can make your purchase knowing that the best research was utilized to make your decision. We came up with the popularity score for every gun safe provider while analyzing 19 expert sites that are trustworthy. Based on our detailed evaluation, each gun safe is assigned an expert popularity score based upon how many times each product is positively mentioned by experts in the industry. By analyzing all the expert review sites our algorithm summed up the average ranking for every gun safe in their rankings and that is how we came up with the final score for each gun safe brand. We managed to gather more than 7963 reviews from 85 reliable sources and our algorithm calculated the average score for each brand. In order to understand how satisfied those consumers were, we analyzed the total number of reviews. We collected all the reviews and the number of stars people gave for each product. Based on these findings we came up with the average customer rating. This is how we managed to bring out the gun safe reviews through which you know how the consumer can rate the gun safe. Through this, we show both sides of the product whether it’s positive or negative in nature. This then makes it a negative factor in our algorithm. This as a result makes the best gun safes reviews. That is why gun safes reviews not only have positive comments mentioned but also the negatives as well.